This Halloween I created an indoor halloween light effect using a Raspberry Pi and a PIR sensor. 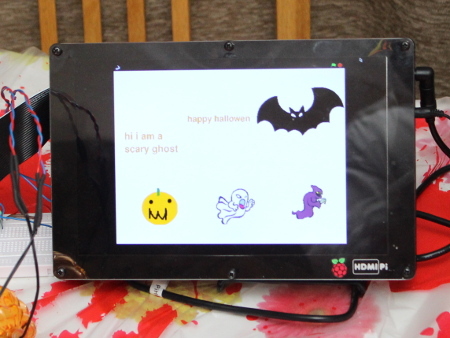 Unlike previous years my children weren't really involved in making this one, which is because my 9 year old daughter decided to create her own Raspberry Pi based Halloween Project. She has created a Raspberry Pi, Makey Makey Pi-ano. It's a musical keyboard using conductive play-doh shaped into pumpkins and ghosts using a biscuit cutter. The Makey Makey converts the touch contact into a key-press which is passed to the Raspberry pi. In scratch these key presses are detected and used to play a short sound and light up a LED pumpkin using Scratch GPIO. More details on using Scratch GPIO in presentation mode on the Raspberry Pi. Take a quick look at the video below (sorry no sound due to the speaker used being very quiet compared to the noise of the Halloween Party we were having in the background). The LED pumpkin lights are from a shop bought Halloween decoration which I broke apart and soldered on solid core cables to make it easy to plug them into a breadboard. They were then connected to the relevant GPIO ports through a 220 ohm resistor. I helped with the electronics and setting up the Scratch GPIO communications, but the rest of the programming is all my daughters own work. The screen uses the HDMIPi screen, which is ideal for this kind of project. You can download the software scary-pi-ano.sb. Don't forget to install Scratch GPIO extensions first. It's good to keep my daughter interested in programming. She doesn't do as much as she did when she was in the Code Club I was running, but she does still enjoy it when we find a project she is interested in. My daughter also edited the video herself using kdenlive running on Linux.